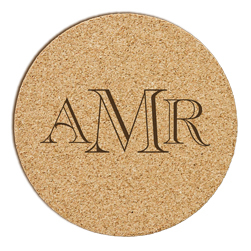 The Reynosa Monogram Cork Coaster includes a set of 6 absorbent cork coasters (4" round x 1/8" thick). Choose from 6 unique monogram styles and we will laser-etch the personalization with extreme precision. These flexible coasters are long-lasting. Each additional identical set of 6 is $17.00.